America’s foremost novelist reflects on the themes that preoccupy her work and increasingly dominate national and world politics: race, fear, borders, the mass movement of peoples, the desire for belonging. What is race and why does it matter? What motivates the human tendency to construct Others? Why does the presence of Others make us so afraid? Drawing on her Norton Lectures, Toni Morrison takes up these and other vital questions bearing on identity in The Origin of Others. In her search for answers, the novelist considers her own memories as well as history, politics, and especially literature. Harriet Beecher Stowe, Ernest Hemingway, William Faulkner, Flannery O’Connor, and Camara Laye are among the authors she examines. Readers of Morrison’s fiction will welcome her discussions of some of her most celebrated books—Beloved, Paradise, and A Mercy. If we learn racism by example, then literature plays an important part in the history of race in America, both negatively and positively. Morrison writes about nineteenth-century literary efforts to romance slavery, contrasting them with the scientific racism of Samuel Cartwright and the banal diaries of the plantation overseer and slaveholder Thomas Thistlewood. She looks at configurations of blackness, notions of racial purity, and the ways in which literature employs skin color to reveal character or drive narrative. Expanding the scope of her concern, she also addresses globalization and the mass movement of peoples in this century. 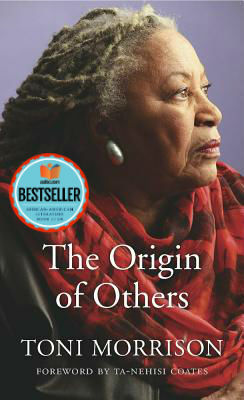 National Book Award winner Ta-Nehisi Coates provides a foreword to Morrison’s most personal work of nonfiction to date. Tell us what do you think about The Origin of Others.